Here at Xtreme Snow Pros, we don’t just power down our operation during the warm months. 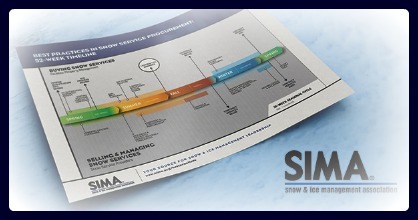 We adhere to a strict 52-week planning cycle, put forth by SIMA for a Snow Service Procurement Visual Timeline. As we know, the timing of the snow service procurement process is chaotic and often done last minute, which is why we work with a timeline that streamlines our services and offerings, while fortifying our systems in place before the first snowfall. To arrive at the SIMA timeline, the organization underwent a review process that included recruiting 18 stakeholder reviews, representing snow service providers/contractors, facility managements, deicing material supply and equipment supply. The timeline commitment is that it’s an open-access timeline to suppliers and consumers, available at no cost, educational in nature, comprehensive, and transparent in its findings and offerings. After serious reviewing and collaborating to arrive at the timeline, comprehensive information aggregation and collaboration went on to development a standard against which all winter weather cleaning and removal companies can measure against. We’re proud to work in adherence to the SIMA 52-week timeline plan, helping our operation to evaluate and expand upon our services for the next winter season. As we come out of the 2017.18 winter season, (just barely), the summer, warmer months are ahead of us, when it’s natural to push the worry and concern of snow to the side. However, as we all know, that winter weather comes knocking much sooner than we want to think about, which is why now is the time to plan. As part of the timeline, for this spring season, we will oversee vendor qualification, RFI distribution, responses, and reviews, confirmation of existing multi-year contracts, and kick-starting the RFP process. By summer, we will meet the RFP response deadline, go through a Q&A walkthrough negotiate contracts and legal review, with the final contracts awarded by the end of the summer. Come fall, training and preparation for staff will be all day and all night, with our services kicking back into gear by mid-fall. Then, come winter, our full suite of services, monitoring oversight, technological infrastructure, and pre-weather warning systems will be in full swing, helping everyone to safeguard their commercial properties moving forward. Are you thinking about coverage for this winter? Now is the perfect time to start planning for the safety of your property. As we all know, 6-months can disappear in the blink of an eye.